Charlene and Richard began developing Nana Cardoon Urban Farm and Learning Center long before the 3rd grade through high school students that came to visit last month were even born. Yet having the 76 girls from the Chicas Youth Development Program explore, discover, and learn from this land was just what they had in mind over thirty years ago. Back in the 80’s they began to build organic soil, plant a diverse orchard, develop an infrastructure to support an urban farm, and focus on how they could help neighbors and community members of all ages learn about sustainable and healthy food and farming. Join the 3rd through 5th grade members of the Chicas Youth Development Program, a Adelante Mujeres program, as they spend the day on the farm. (clockwise from left) Kathy Alvares explores the taste of freshly ground flour; Abigail Grande inspects a water feature; Andrea Tellez seasons the garden salsa she helped make. (clockwise from left) The table is set and ready for the Chicas lunch; signs throughout the garden stand ready to guide students in learning; Charlene talks with volunteers about the various work stations for the day; onions lay in wait, ready to harvest for salsa-making. Plenty of preparation takes place before the Chicas visit. 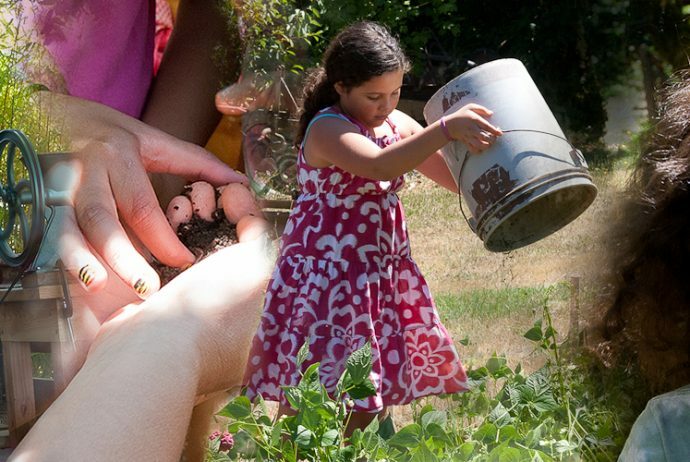 Charlene and Richard, the co-farmers at Nana Cardoon, worked with Eden Acres, an environmental literacy organization, to design an activity-packed day filled with hands-on learning. Over 10 volunteers also participate during the program — from setting up the learning stations to manning the grill, from leading projects to washing dishes. (clockwise from left) Cytlalli Najera grinds wheat on the bicycle grinder; Richard talks about how wheat is harvested and the process to prepare it for use with (l to r) Leticia Guiterrez, Yuliana Garfias and Andrea Tellez; Kathy Alvarez (l) and Natalia Martinez (r) sift the freshly ground wheat. A focus on the cycle of soil to seeds, planting, tending, and harvest is always present at Nana Cardoon. Also, how the harvest comes to table plays an important role, and was highlighted for the young students as they ground freshly harvested wheat using the bicycle-powered grinder. (clockwise from top left) Janette Santiago grinds corn as Charlene looks on; the molino; Charlene helps Natalia Martinez grind corn; a handful of the organic corn to be ground and used for tortillas. Grinding the organic corn that was made into tortillas, cooked on the outdoor grill, and then tasted by the girls, opened up a discussion about various ways our food is produced and processed. The hands-on activity helped make the concept of good, clean and healthy ingredients and foods more understandable. (clockwise from top left) all salsa ingredients, except lime, were harvested at Nana Cardoon; Amalia Guzman uses a stone mortar and pestle; (l to r) Itzel Ortiz, Yuliana Garfias, Leticia Guiterrez work together to make salsa; Moncerrat Villanueva crushes the vegetables for the salsa. One of the morning projects got the girls out in the garden digging potatoes that were then later served at lunch. (clockwise from top) Lunch of garden greens, potatoes; fresh salsa, beans, and tortillas; the Chicas enjoy the meal they just helped to make; a plate of the freshly made tortillas; Charlene and Leticia Aguilar, Chicas Program Coordinator, serve up the plates. (clockwise from top left) (l to r) Daniela Garcia, Brianna Garcia and Emma Aguilar spread mulch on the bush beans; Janette Santiago with Richard working in the field: discussion time for one of the groups; exploring soil and worms! After lunch the Chicas helped mulch some of the crops as they learned about water conservation. Then they got a look, and feel, of composted soil complete with the worms. Nana Cardoon gets all the senses involved in the learning process. (clockwise from top left) Charlene and Elena Rasmussen after a happy day with the Chicas; a thank you signed by all; 3rd-5th graders from the Chicas Program with Charlene, Richard, Adelante Mujeres program staff, and volunteers. The many smiles express the delight of all! “Can I come back to Nana Cardoon?” Chicas comment after farm visit.